Havana City is the capital of Cuba country, the must visitated city of Cuba. Situated in the north cost of Cuba, Havana is built around a harbor and has beautiful spanish colonial architecture with plazas and palm trees. Many of the Havana's building are crumbling and they haven't seen a coat of paint for many years. Nevertheless the city's importance was recognized and Havana was designated an UNESCO World Heritage Site in 1982 and work is now under way to preserve its heritage. In Havana there are several zones where is best to rent a private home. Any choice depends entirely on your vacation goals. If you are looking for the beach, the best places are Guanabo and Santa Maria del Mar. Guanabo is a little town with a lot of people, disco clubs, many shops, restaurants, beach, pizzerias, resto-bars, bars-cafes, car rental and moto rental. There is also a gas distributor and in general, Guanabo is quite eventful. For its parts, Santa Maria del Mar is a touristic zone. There is six hotels on this zone, the Megano Hotel, the Tropicoco Hotel, the Las Terrazas Residence / Hotel, the Atlantico Hotel, the Itabo Hotel and the Brisas del Mar Hotel (at the top of the Santa Maria hill, with an excellent view and swimming pool, but very poor cooking). This zone is special for all kinds of sports , beaches, goods restaurants , especially grills, massage, health services, car rental, disco clubs and shops. In Santa Maria del Mar, there are also some private houses for rent, distribuited from the beach to the hill. Some of these are very nice and some other are rented by the government. The Habana del Este (East Havana) is a conjunction between the beaches of Guanabo and Santa Maria and the true Havana City. Being in the middle, this zone is near to both places and has as well some other important sites, like the Via Panamericana (very special for its sportive ambiance, its services and big shopping centers). Habana del Este includes also the Alamar Residential Zone, very ugly pile of popular buildings, but having two interesting beaches. Also, near to the same zone, there is the huge Guanabacoa municipality, a real town in its own, even if a little isolated. This "town" is very characteristic and very interesting, also because of its santeria reputation (a sorte of afro-cuban religion). Here there is also some houses and their speciality it that they are often less expensive than the others, but you might perhaps to rent a car. The Old Havana zone it's the very beginning of the true Havana City and it's perhaps the more visited by the tourists. Recently, some zones of Old Havana were renewed and there is some absolutely beautyful and unforgottable sites. To complete the ambiance, in Old Havana there is lots of restaurants, bars, cafes, shops, museums, churches, expositions, theaters, hotels, monuments and other nice buildings. Dont forget to walk the Prado Avenue. Also there is the famous Castle of Morro across the bay and the legendary Malecon coastline . The Morro castle zone has also a lots of restaurants, museums, shops, shows and even houses. But the more important event is " the ca?onazo" : each night at 9PM the big canon in the Morro shout... the event is visited by hundred of tourist each day. Logically, in the Old Havana, private homes are very plentiful. We have some in our web site. 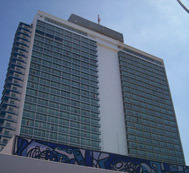 The Vedado area, reachable after crossing the Old Havana and the Central Havana to the west, is the modern center of the Havana and its true downtown. It's especially recommended for those who like eventful vacations. Some of the more important hotels of Havana are there: the Melia Cohiba Hotel, the Tryp Habana Libre Hotel, the National Hotel of Cuba and others. There is also lots of disco-clubs, cabarets, cinemas and theater. Brief, the fun is everywhere in the Vedado zone. Among the important places, there is the Coppelia dairy, the Rampa, the Parisien Cabaret, and the 23th street. In this zone there is plenity of private homes waiting for rent, where you'll find all comforts. And finally, among the important zone we have to mention the Miramar area, situated next to Vedado and also close to the Malecon coastline. As mentioned, this is a residential and commercial zone and it's the more prestigious area of Cuba even if less centric than Vedado and more peaceful. Most embassies, offices, shops, hotels and miscellanea business are there. In Miramar there is, without a doubt, the largest number of private houses available and the best. This zone is more expensive than others but it worth it.